The single and double 3-layer Flock Superior feature a built-in electric pump for convenience; the pump comes with a plug to connect to an external power supply. The Flock design allows campers to sleep well clear of the ground and Flock Superior takes that height up to 45 cm not only oﬀering insulation and sleep comfort but also make getting in and out much easier. The raised all-round edging oﬀers ﬁrmness for extra stability and the tough PVC material copes easily with the demands of camping life. Extra high in a stylish Grey colour with a soft stylish Light Grey velour top for a soft, warm feel. 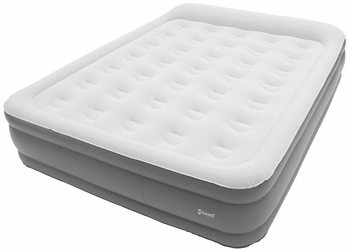 We purchased this air bed for occasional use at home for additional sleeping and camping.We found it so much more comfortable and convenient than camp beds.We found it quick to inflate easy to deflate lighter and smaller to store than the camp beds. We slept on it five times this week when guests used our beds and found it more comfortable if the bed was inflated harder making sure not to over inflate. A good buy so far. Perfect... does exactly the job it's supposed to and is really comfortable too especially being that little bit bigger as well as being higher off the ground, so much better than the standard airbeds it's the closest you will get to a normal bed while camping I think. Usual Out well quality. Great Camping World price. Easy inflate/deflate. Feels very durable.